Frontier now offers nonstop flights to San Antonio, starting in August. 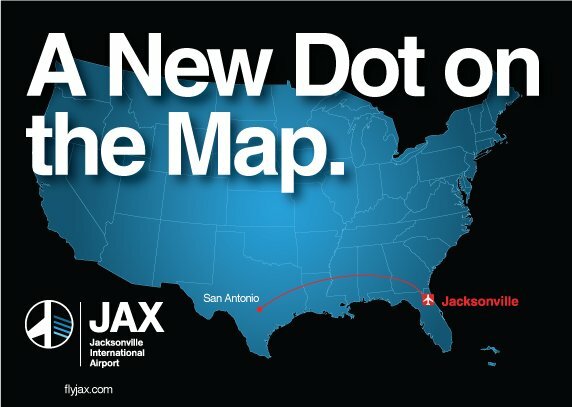 Today low fare carrier, Frontier Airlines, announced new service from Jacksonville International Airport to San Antonio. The new route follows last week’s announcement that Frontier is adding six new destinations: Las Vegas, Buffalo, N.Y., Kansas City, Mo., Milwaukee, Wis., Minneapolis/St. Paul, Minn., and St. Louis, Mo. The new San Antonio flights begin August 12, and operates Tuesday, Thursday and Sunday. “This new service adds yet another new destination and affordable option for our leisure and business travelers,” said JAA CEO Steve Grossman. Frontier Airlines’ fleet consists of nearly 80 Airbus A320 jet aircraft. With nearly 200 more new aircraft on order, Frontier will continue to grow and modernize its fleet to deliver on the mission to provide affordable travel across America.